Physicochemical Properties: Cupric nitrate hydrates-trihydrate is a dark blue columnar crystal. It’s easy in moisture absorption. Specific Density: 2.05, Melting Point: 114.5℃. It will be degraded when heated at 170°C. It is apt to dissolve in water and ethanol. The aqueous solution is acidity. 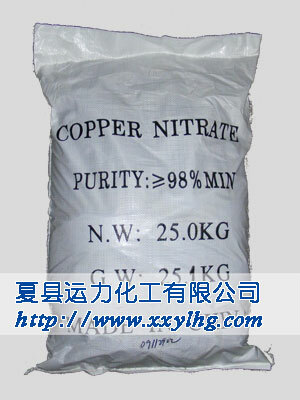 Cuperic nitrate is a trong oxidizer which can cause burning or explosive if heated, rubbed or striked with combustible materials. It will produce the poisonous and stimulating nitrogen oxide gas while burning. It is stimulate to skin. 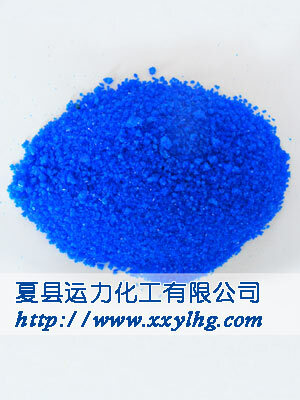 Applications and Usages: Cupric nitrate is used as catalyst, oxidizer, activating agent for luminescent powder, and photosensitive resistance materials.